This book was actually really good. It was a little ploddy at times, but in the main I really liked it. It follows a group of thieves and rogues as they attempt to stop the demonic incursions into Golarion by marching right into the Worldwound itself and destroying the Tower of Yath there, which has been acting as something of a locus of power for the demons. Each of the six brigands is a fairly interesting character, and the folks they meet along the way also make for an enjoyable read. So why did it take me two weeks to read? The book is told in the present tense, which I’m not all that much a fan of, and while the characters are fairly interesting, as I said, they’re not stand-out amazing to the extent that I was all that interested in the story. We have a halfling lock-picker, a fire mage, a drug-addict bard, a pacifist half-orc, a noblewoman blade fighter, all of whom are led by a sort of dashing rogue thief. They all seem to have a shared history that is only really ever implied, and their motivation for going into the Worldwound and destroying the Tower of Yath is a bit precarious at times, and I found myself not altogether convinced by it – basically, demon invasions are bad for business, so they risk death and destruction to ensure they can still go about their con-artist ways. The book starts fairly dramatically, with a full-on demon invasion of the town of Mendev, and then sees the main protagonist, Gad, assemble his crew to take down the demons. It was during these opening half-dozen or so chapters that the realisation finally dawned upon me: this is basically a role-playing game adventure told in novel form. As soon as I realised this, the novel became so much more enjoyable to read, and made so much more sense to me. The way the characters would move from place to place and encounter obstacles in their quest, which usually gave one character a major role and several others a minor part to play – the whole thing was really nicely done, and the present-tense storytelling makes so much more sense, as this is what you would do if you were a GM. Some of the reviews I’ve seen for this book have mentioned its haphazard nature, and the cipher-like characters with little backstory explained. If you approach this as a RPG story where you don’t have to roll dice but can just sit back and see what happens, then the book is definitely worthwhile reading. So, where am I up to with my Rise of the Runelords campaign? Well, Darago the Necromancer and Sajan the Drunken Master finally started on the path through Burnt Offerings, and it started out really well! I’m playing this adventure path solo, which isn’t all that complicated if I’m honest, as the only real thing to remember is to turn over the top of the Blessings deck after each character takes a turn. Suddenly, I’m seeing those cards that allow you to discard to explore your location in a whole new light! During the first game, Attack on Sandpoint, the villain, Ripnugget and Stickfoot, kept turning up within the top two or three cards of the locations, so it was over rather quickly! I have to say though, the main villain of this scenario is a goblin riding a lizard – how awesome is that?! Next up, we have Local Heroes, which I remember playing back when the game was still fairly new, and from memory I thought it was a kind of respite-quest, where you basically get to skulk around and see if you can get more stuff. Well, not so this time around! Darago actually died to a Skinsaw Cultist! Good grief! I was actually, genuinely bummed when this happened, having been really excited to get going with the character back when I started my quest. This all happened at the end of May, and I haven’t yet gotten round to starting the new character, Seelah the Paladin. 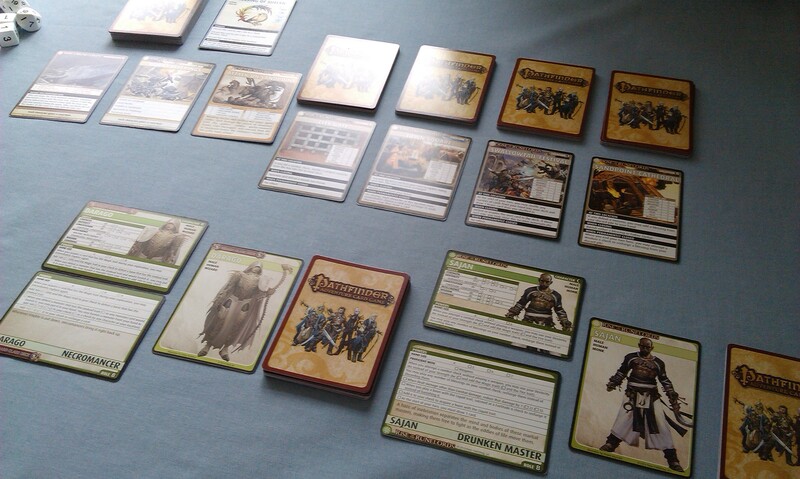 My love of Lord of the Rings recently resurfaced, of course, so I’ve been thinking more about that game, though I have still picked up the Inquisitor class deck – for the inevitable death of either my Monk or Paladin characters! I do think I was perhaps a bit too reckless with Darago, discarding in the hope to get better cards, and not realising that I could in fact be decked by enemy damage. Gah! On the Threshold of Discovery! The ancient lands of Osirion are blanketed by the sands of time, and eldritch secrets and vast riches lie just beneath the sun-blistered surface. As modern Osirion opens its tombs to outsiders for the first time in centuries, many of these lost treasures and secrets are now emerging—some more malign than others. Can your group of heroes brave terrible guardians, foul cults, and the burning sands of the desert to stop the rebirth of an ancient tyrant? This complete cooperative strategy game pits 1 to 4 heroes against the monsters, curses, and traps of the Mummy’s Mask Adventure Path. Choose your character’s class, build a deck of equipment, magic, and allies; and explore dangerous locations as you journey through an exciting fantasy tale. As your adventures continue, your characters add unique gear and awesome magic to their decks as they gain incredible powers, all of which they’ll need to challenge more and more powerful threats. So that is really exciting! 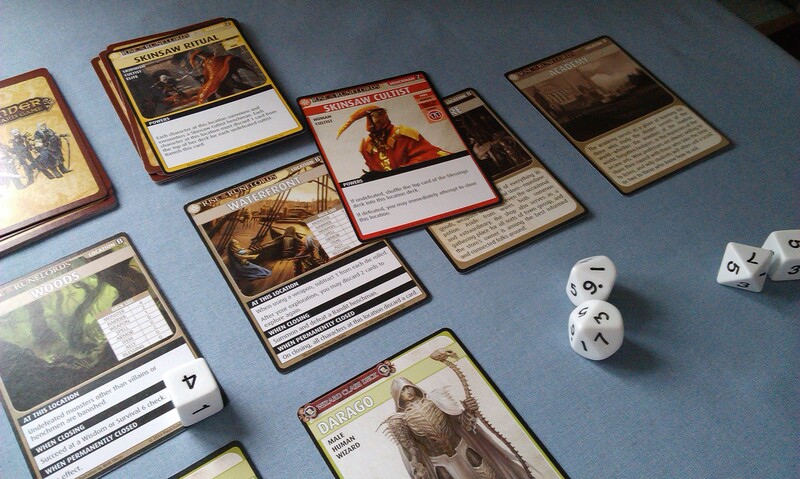 Stay tuned for more Pathfinder goodness, anyway, as I hope to make it through to the end of Burnt Offerings soon!